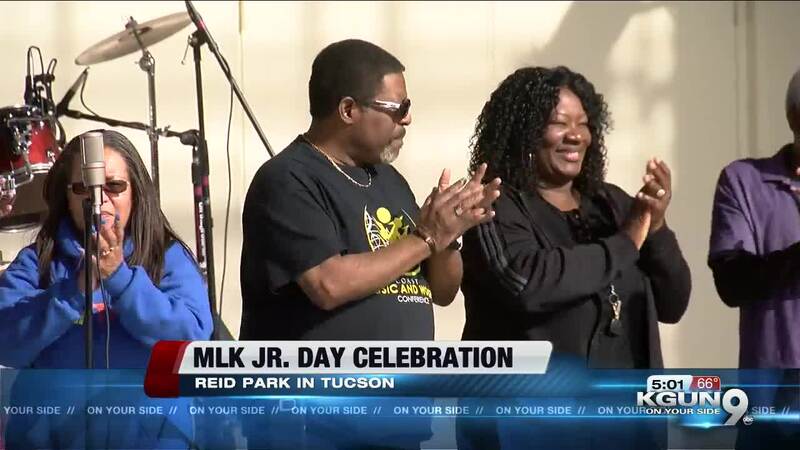 March and celebration honoring Martin Luther King Jr.
TUCSON, Ariz. — The national anthem marked the end of the march and the beginning of the celebration. “We need more of this, more love is what we need,” said Murryelle Bothwell enjoying the celebration. It was a beautiful day at Reid Park. Full of music and children playing. Gil Rainey was there helping his wife cook. He says it’s important to celebrate the life of Martin Luther King Jr. and even more important for his kids to learn MLK’s lessons. “Teaching them to strive for whatever they want and don't let nobody deter them from reaching their goal,” said Rainey. Speakers included the Tucson mayor and civil rights leaders. “You name it, from preachers to politicians, someone will be speaking,” said one of the organizers and IMA Tucson President Dr. Damond Holt. The march and celebration has been a tradition in Tucson for more than 30 years. Holt says the state has come a long way. Many people we talked to say the celebration is a good start, but there is still more work to do. “I think it is great I think we need this and much more not just on today but maybe every month for people to realize the dream of Martin Luther King,” said Bothwell.